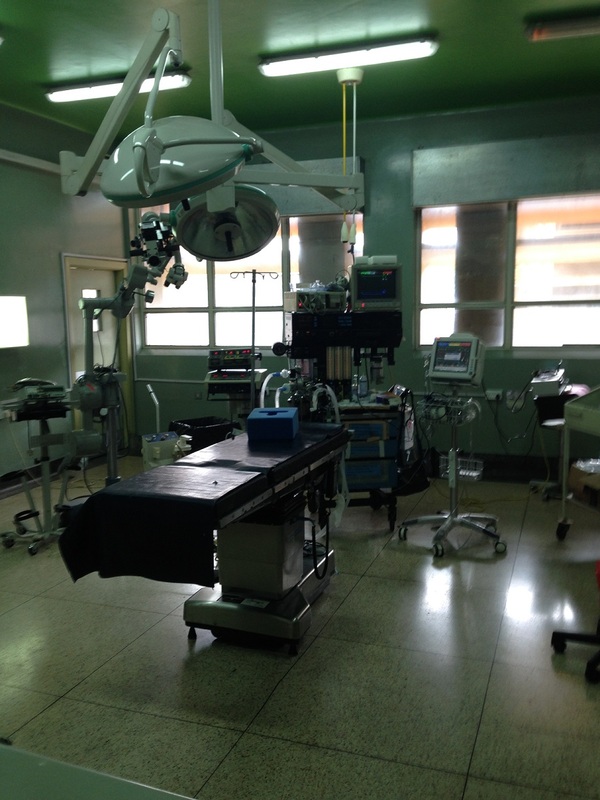 One of the operating rooms that went unused because of the lack of anesthesia gas. The day began like any other and I was on the wards rounding with the neurosurgery team. Each morning we see around 50-60 patients, so the rounds last a few hours. We were about an hour into the session when we began rounding in the pediatric neuro wing. A quick look around the room will reveal kids with conditions ranging from minor/major head injuries due to accidents, to those with severe hydrocephalus and other maladies. There are three kids that stick out in my mind. The first is a young boy who was admitted following a boda-boda accident and had an operation a few weeks prior. He was the most energetic kid in the ward and as we were discussing things with his mom he gave me the biggest smile I’ve ever seen through the entire discussion. Just two beds over was a little girl with severe hydrocephalus who wasn’t responsive and whose mom looked very worried. Despite the language differences I could tell from her tone that she felt that she was losing her little girl. After discussing the plan to move forward with surgery as soon as possible we had to move on to the next patient; despite the mother still having questions and a distressed look on her face. The third patient was another kid with hydrocephalus but was a very young boy. His situation wasn’t as dire, but he still needed an operation to place a shunt or else his condition would progress. The mother had purchased the shunt, but was skeptical that it would help her child. She decided that the shunt wasn’t the best option, so her son was discharged against medical advice. As we were walking out of the ward I couldn’t help but feel conflicted. There was extreme joy from interacting with first little boy, heart-wrenching pain with the girl, and a feeling of misunderstanding with the mom of the little boy. Before I was able to fully process how to feel, a new patient was carted through the halls. It was a young man who had gotten into an accident and had an epidural hematoma that needed to be urgently evacuated. We quickly examined him and told his family that he would receive an operation as soon as possible. At the end of rounds we had around 10 patients who would have immediately benefitted from surgery and about 5 who needed urgent operations. The little girl with severe hydrocephalus and the man with the epidural hematoma were both on the urgent operation list. I was prepared to hear that it was time to go down to the operating rooms, but instead the comment that came from the head resident was, “We don’t have any gas.” At first I couldn’t comprehend what he meant or rather didn’t want to accept the conclusions that followed from that statement. He was referring to the fact that the operating rooms didn’t have any anesthesia gas and thus no procedures could be performed. A fact he knew since the start of rounds, and why he kept repeating "as soon as possible" to each patient that needed surgery. Running out of gas at the national reference hospital obviously has dire consequences not only for the neuro patients but for all patients in need of surgical procedures. People possibly dying due to lack of anesthesia is something I had never encountered. By the time I left none of the neuro patients had been able to get their procedures, because we couldn’t locate any gas. Etched in my mind was the distressed look in the face of the mom of the little girl. Since the next day was a research day for me, I wouldn’t find out until later what happened. That night I went home saddened and frustrated by the situation and the fact that I felt helpless, as there was nothing I or really any of the surgeons could do. Before falling asleep I was overcome with a deep sense of appreciation for the surgeons and staff of the hospital, because despite the challenges, day in and day out they do everything in their power for every patient.